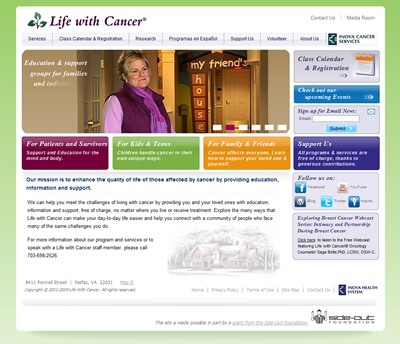 Life With Cancer needed a more interactive web site to engage their patients and patients' friends and family. The previous site was text-heavy and had extremely hard-to-use navigation. Once a web site visitor was away from the home page they often couldn't find important links that were found only buried within the text of the home page. The class calendar was a static PDF file, and registration was done by old-fashioned fax or telephone. The new web site engages the user and helps "funnel" in different types of users according to their particular needs. The class calendar has a prominent spot on each page and is extremely interactive and easy-to-use, especially important to patients enduring cancer battles. Users can now sign up for classes online, and get an email receipt. Email reminders are also automatically sent to registrants. Life With Cancer staff and volunteers have an internal administrative system that makes it easy for them to enter class information and track class participation. After the redesign of the web site Life With Cancer has seen more than double the web traffic. Life With Cancer "Before" Life With Cancer "After"